Painting: A Corporal Work of Mercy. 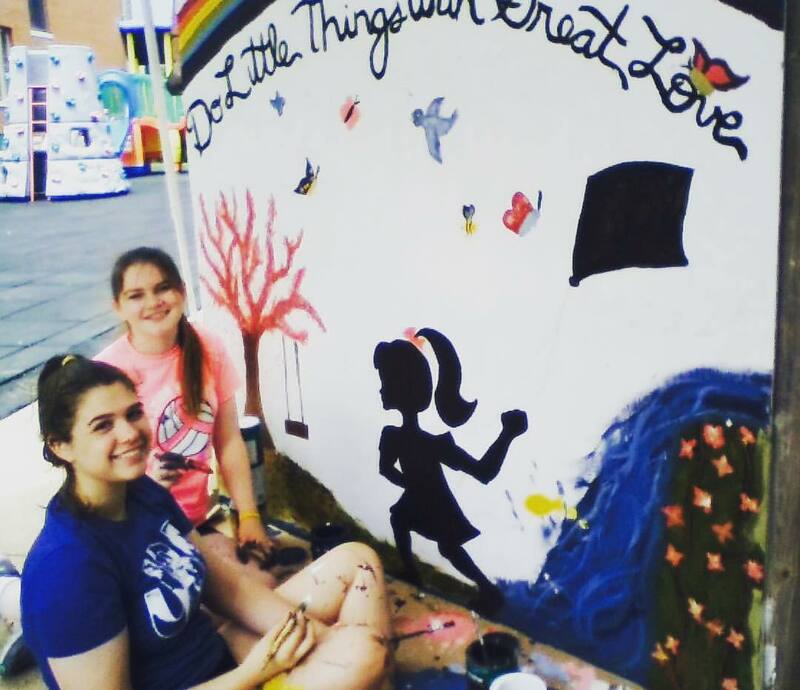 Doing Little Things with Great Love. What would summer be like without a road trip? I know what part of my summer was like with a road trip. This year I took a road trip with a Visitation Companion and 11 high school girls, another Visitation Sister and a high school counselor! It was fun, Fun, FUN!!! 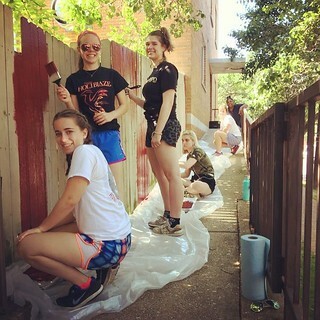 VISTORY is an annual service trip for students from Visitation High Schools around the country. For about a week each year 30 – 50 students from St. Louis, Washington, DC and the Twin Cities travel to a host city for a time of getting to know each other, learning more about Salesian spirituality and serving the elderly, homeless, those on the margins and those in the streets. I have been part of VISTORY since 2004 and I have always enjoyed traveling and working with a variety of adult chaperones. Sometimes I invite the mom of a participant to help; sometimes another sister and sometimes a former participant. 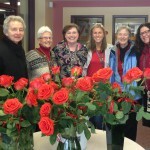 This year I advertised to members of our Visitation Companion group and Nancy Timmerman stepped forward. I was immediately excited because Nancy had organized many service trips before when she and her husband served as the deacon couple at a church in Forest Lake. 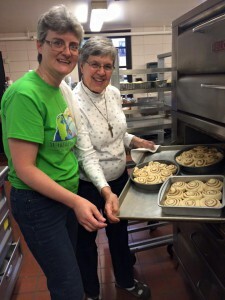 They participated in a service trip to Guatemala with a group from St. Philip Church. There will always be glitches on such a trip but Nancy was a seasoned chaperone and able to go with the flow. We were not exactly Thelma and Louise riding in a top-down convertible…two adults curled up with several sweaters in an air-conditioned coach bus complete with bathroom on board! Getting there was half the fun. It gave the opportunity to connect with the Vis contingent from Mendota Heights. Every Eucharist is a rehearsal for the heavenly banquet. 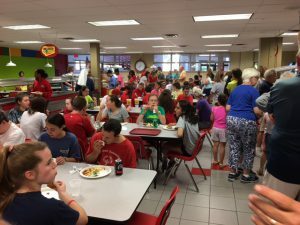 Students and volunteers share a meal. The Corporal Works of Mercy was the overall theme focused on by the student/faculty planners from St. Louis Viz. Of course, feeding the hungry at soup kitchens or sorting clothing to be distributed to new admissions at a home for troubled youth or cleaning and organizing school classrooms at an inner city parish school with no maintenance budget are in line with what someone would list as the corporal works of mercy. Taking care of infants and children of working parents at a combination pre-school/day care is a modern version of caring for orphans and widows perhaps. Planting a memorial garden was certainly a way for caring for the dead and painting a mural as a way to beautify the surroundings for homeless city dwellers. One service opportunity was definitely based on an understanding of the theology of the works of mercy…if not actually Jesus’ words. Several hours were spent by all of the students and chaperones together with a group of 18 to 30 year old Special Olympians and their parents. After a few anxious moments by all, the margins disappeared…in fact, at one point there were more outfielders than spectators. A surprise storm forced everyone inside for the game but spirits weren’t dampened. Everyone was close together and the Visitor’s team definitely had the advantage —- some of them had been playing together with the same volunteer coaches for 15 years and their team had won some Special Olympic awards in baseball! The pictures below show the entire the VISTORY team with the St. Louis Special Olympians in the gym, an after dinner water balloon game on the soggy grass, and the pot luck meal with our new friends and their families and coaches, cooks and a myriad of other folks. Looking around the dining room I was reminded of a friend who says that every Eucharist is like a rehearsal for the heavenly banquet…and this really was a heavenly banquet here on earth! For more pictures of VISTORY and other summer activities, visit us at our, Instagram and Flickr pages. Join us in welcoming Brenda Lisenby formally into the Novitiate! (This is a period of 2 years of more intense study of the vowed life in the Order of the Visitation). Click to see photos taken Wednesday, May 4, 2016 at a private morning ceremony. Brenda received the following gifts: a medal of the Visitation; a candle as reminder of her Baptismal vocation (which is all of ours); copies of our Constitution (rule of life) and Companion to the Constitution (a contemporary articulation of the rule of life). 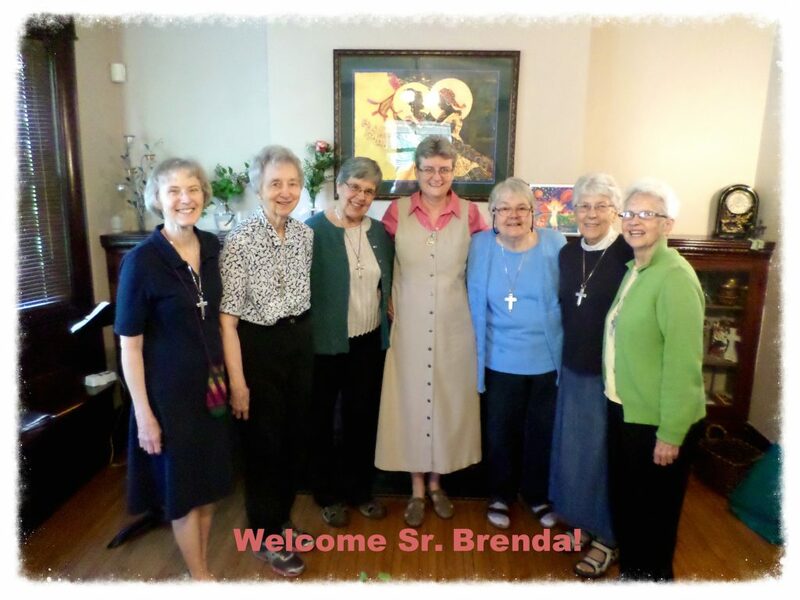 Flickr Photo Album: Welcome Sr. Brenda Lisenby! Facebook Alert! Twitter Alert! Flickr Alert! Open your heart to the Great Mystery of the Incarnation and share. 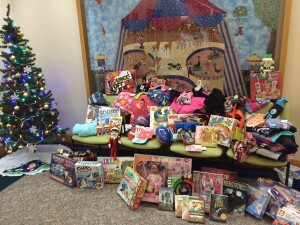 We anticipate the delivery of many items to fill Christmas bags for our families; (see FB photo album; Watch VIDEO). The wonderful gift of living here is that neighbors near, & family and friends from afar come together to volunteer to bring the true spirit of Christmas to one another and to those we serve. So….Keep posted on our social media channels! * We hope to give you a pictorial experience of our week. Our Catholic Youth Campers had a fantastic week from June 21-26! On the last day, families went to McGregor, where Catholic Youth Camp- Minnesota​ is located to see the camp, and to enjoy a special end of camp program. We Sisters continue to be unconditionally committed to this campership program, which give our city kids a fun, fun camp experience! Thank you, CYC sponsors one and all!!! 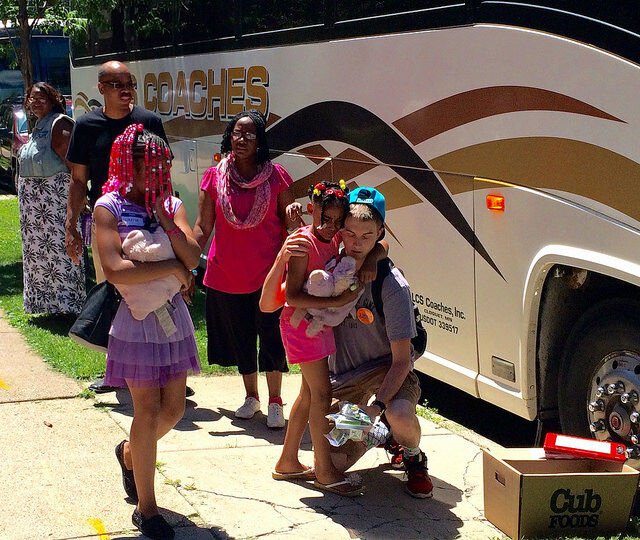 *Click to see photos from the send off at our Flickr Photo Album. 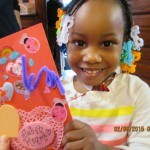 How many ways are there to communicate love for your community? For the families that inspire and nurture our very existence? What are we called to say, do, be — in response to the outpouring of God’s love born out through one another? How do we, as the Visitation Community, express our love to you, as friends and beloved strangers, who call us daily into our ministry of prayer and presence? This year, as we mark the Feast of St. Valentine, we share with you snapshots from two different expressions of our community outreach and prayer-born love and gratitude. How many ways can you see the Visitation embrace in these photos? Where do you spot Mary and Elizabeth? Can you detect a leaping womb, heart, or mind? Live+JESUS!